The Three Commissars who succeeded the late Father Fidenzio Volpi. 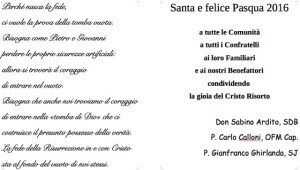 (Rome) Apostolic Commissioner, assigned by the Congregation of Religious, and his two assistants have published "strange" Easter greeting on the website of the Franciscans of the Immaculate, says Messa in Latino. After the first Apostolic Commissioner, the Capuchin, Father Fidenzio Volpi, who died in June 2015, the Congregation of Religious assigned a new Commissioner, the Salesian, Sabino Ardito. Unlike Volpi he was assigned two assistants. They are the Capuchin, Carlo Calloni and the Jesuit, Gianfranco Ghirlanda. So that faith can exist, it needs the evidence of the empty tomb. then you will have the courage to enter into the void. It is necessary that we find the courage to enter into the "grave of God," which we built as the alleged possession of the truth. The faith in the resurrection in and with Christ is the basis for the emptiness of ourselves. The Gospels not about "emptiness"
"The link established with the entrance of the Apostles Peter and John to Christ's grave can not convince them," says Messa in Latino . There is never any mention in gospels of "emptiness", not even an "empty grave". Going to the grave, they found there an "angel of the Lord" who descended from heaven, approached the grave and moved the stone. "His appearance was like lightning, and his raiment was white as snow" (Mt 28.2 to 3); "Two angels in white" (Jn 20:12). Whoever enters the grave, "looked to the right to see a young man sitting, who was dressed in a white robe" (Mk 16.5); "Two men in dazzling garments" (Lk 24,4). The women had gone to the grave early in the morning, "but the body of the Lord Jesus, they found it not" (Lk 24:3). They reported to the apostles that "angels appeared who said that he was alive" (Lk 24:23).The apostles thought it was "nonsense and did not believe them" (Luke 24:11). Peter hurried himself to the grave and "saw only the linen cloths" laying there (Lk 24:12). John reported that he was with Peter there, "leaned forward and saw the linen cloths lying," but initially did not go into the grave, while Peter went in and "saw the linen cloths lying and the cloth that had been around Jesus' head but it was not with the linen cloths but wrapped up in a place by itself "(Jn 20: 5 to 7). Then John entered the grave and "saw and believed" (Jn 20:8). The evangelists all testify that Christ was no longer among the dead, but is risen. But why we can not speak of "emptiness", because the resurrection means well, materially speaking, an empty grave, but no "void," because of the Evangelists "mentioned a scene full of light, angels and divine presence," said Messa in Latino . The disciples and the women had to lose any "certainties"
The talk of "certainties" may not convince what according to the Commissioners how "Peter and John" must "lose." From the Gospels it shows that neither the disciples nor the women had any certainty, neither a natural nor an "artificial" one. As Saint Mary Magdalene first went to the grave was "it was still dark" (Jn 20:1). Nobody thought of the resurrection. The Gospels speak of no certainty, but of darkness, doubt, fear, which are reconciled only by going to the grave. You will not find there the body of the Lord, but they do not find there a "void," but a light, an angel, a divine presence and as a sign, the folded linen cloths. You will find the exact opposite of "emptiness" for they saw, and believed even if they did not quite understand. Mary Magdalene even met Jesus at the grave. As women and disciples went for the grave, they were full of doubt, emptiness and anxiety, but no longer, as they came to the grave. At the grave the doubts were transformed into certainty. Before they came to the grave, they had no certainty, not even a "human", which they could give up. "This is the question in the room, what induced the honorable fathers commissioners to formulate this strange Easter congratulation," said Messa in Latino . Their message is also hardly comprehensible as the "emptiness" as "nothing" in the sense of St. John of the Cross. Did the commissioners want to convey to the brothers and sisters of the Franciscan Friars of the Immaculate, a message which purports to be a swipe at their charism, the Founder, fidelity to the Franciscan rule and against their consecration to the Immaculata? Is that all "artificial certainty" meant that you must "lose?" The allusion about the "alleged possession of the truth" remains completely cryptic. "Naturally," the Easter message only makes sense when when it is read as an Easter admonition, which is directed against the monks and nuns who wanted to maintain fidelity to the founding charism of the Franciscan Friars of the Immaculate, to a monastic rule, which is linked to the original rule of St. Francis of Assisi, to the rediscovery of the two thousand year old tradition of the Church, and therefore, also the traditional form of the Rite. It's a message that is directed against the efforts of the Order, to resist those forces and that spirit in the Church, who do homage to some concept of hermeneutics of rupture, because they want this break and approve of it. "The only emptiness', which can therefore be seen in conjunction with the Franciscans of the Immaculate, is a deflated Order, drained of its charism, the brothers and sisters deprived of their founder, of the founder robbed of his spiritual sons and daughters, an Order, which was made ​​defenseless. The only emptiness, "is therefore, the one that is produced by the commissioners on behalf of the religious congregation and with the approval of Pope Francis," said Messa in Latino . The 'Commissioners' can shove it! Since it is so manifestly obvious that these Commissars - both in their words and in their actions - do not have the faith, we can now safely assume that the real problem with the FFI was that they did. Sounds like the dark ages of the 1970's. This is just modernist jargon, making a come back. I remember a Nun on television in the 70's talking about us having to "image the holy", sounded nice in a way but when she was asked what she meant, she did not know! Like I said modernist jargon, I doubt these priests even know what they mean with these catchy phrases. I think its going to probably catch on, these Bergoglians are only trying to revive "the spirit of Vatican ll". might do the trick here! I have never heard such tripe. An insult to the Order and to anyone with three neurons! Really!!!! This is beyond odd. The tower of Babel kind of oddness. A good example of FrancisSpeak. It means nothing but does cause some confusion. One day, in the next era, the FFI will be restored to the glory of their charism which, of course, none of these commissioners have or appreciate. Another Catholic order hollowed out, desecrated and gutted by the modernists--sure the vocations have tanked. God bless you, Tancred, for continuing to shine a light on these scandals. Bishop Giles Butler and his order are traditional Franciscans that live like Franciscans prior to 1965.